Background Cyst infection remains a challenging issue in patients with autosomal dominant polycystic kidney disease (ADPKD). In most patients, conventional imaging techniques are inconclusive. Isolated observations suggest that 18fluorodeoxyglucose (18FDG) positron-emission computed tomography (PET/CT) might help detect cyst infection in ADPKD patients. Design, setting, participants, & measurements Comparative assessment of administrative databases from January 2005 to December 2009 identified 27 PET/CT scans performed in 24 ADPKD patients for suspicion of abdominal infection. Cyst infection was definite if confirmed by cyst fluid analysis. Cyst infection was probable if all four of the following criteria were met: temperature of >38°C for >3 days, loin or liver tenderness, C-reactive protein plasma level of >5 mg/dl, and no CT evidence for intracystic bleeding. Episodes with only two or three criteria were grouped as “fever of unknown origin”. Results Thirteen infectious events in 11 patients met all criteria for kidney (n = 3) or liver (n = 10) cyst infection. CT was contributive in only one patient, whereas PET/CT proved cyst infection in 11 patients (84.6%). In addition, 14 episodes of “fever of unknown origin” in 13 patients were recorded. PET/CT identified the source of infection in nine patients (64.3%), including 2 renal cyst infections. Conversely, PET/CT showed no abnormal 18FDG uptake in 5 patients, including 2 intracystic bleeding. The median delay between the onset of symptoms and PET/CT procedure was 9 days. Conclusions This retrospective series underscores the usefulness of PET/CT to confirm and locate cyst infection and identify alternative sources of abdominal infection in ADPKD patients. Autosomal dominant polycystic kidney disease (ADPKD, Mendelian Inheritance in Man #173900) represents the most common inherited kidney disease and is characterized by the development of numerous renal and hepatic cysts from various renal tubular segments and biliary ducts, respectively (1,2). Cyst growth causes organ enlargement leading to abdominal and/or loin discomfort. Cysts are also associated with acute complications, such as bleeding and infection. Cyst infection (CI) represents the most challenging diagnostic issue in patients with ADPKD, with a substantial risk for abscess formation and life-threatening sepsis (3). The diagnosis of CI remains uneasy because of the lack of specific symptoms and signs and the limitations of conventional imaging procedures (4,5). The elevation of serum carbohydrate antigen 19.9 (CA19.9) has been recently proposed as a diagnostic marker for hepatic CI (6). In addition, isolated reports have suggested that positron-emission tomography (PET) after intravenous injection of 18fluorodeoxyglucose (18FDG) might help identify tissue infection in ADPKD patients (7–11). Inflammatory cells are indeed characterized by a high metabolic activity and increased uptake of glucose analog, 18FDG (9). 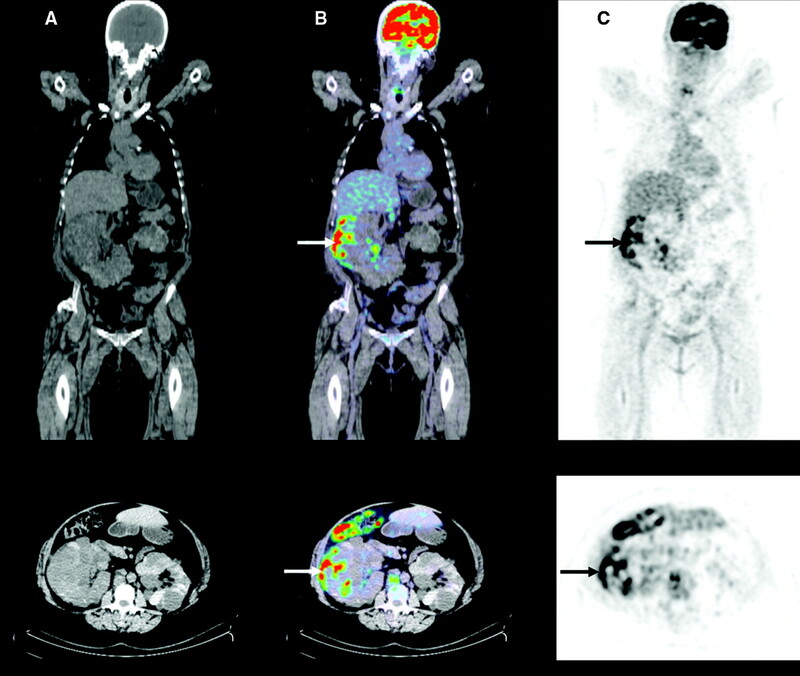 Moreover, the modern combination of PET with computed tomography (CT) may improve the localization of pyocysts by integrating metabolic and anatomical data (12). This study retrospectively investigates the accuracy of PET/CT imaging in diagnosing CI in ADPKD patients. The assessment of the computerized billing database of the Université catholique de Louvain Academic Saint-Luc Hospital (Brussels, Belgium) listed all ADPKD patients admitted for suspicion of abdominal infection from January 2005 to December 2009. Among these patients, those who underwent a PET/CT were further identified using the administrative records of the Division of Nuclear Medicine. All of the medical files were reviewed. Diagnostic criteria for ADPKD were the presence of polycystic kidneys in at-risk patients or, in the absence of family history, the presence of more than three renal cysts for individuals aged between 15 and 39 years, more than two cysts in each kidney for individuals aged 40 to 59 years, and more than four cysts in each kidney for individuals aged >60 years (13). The diagnosis of renal and liver CI was on the basis of the following criteria recently proposed by Sallée et al. (4): (1) CI was definite when confirmed by cyst aspiration showing neutrophils and bacteria; (2) CI was probable in the concurrent manifestation of four conditions—fever (temperature of >38°C for >3 days), abdominal tenderness in kidney or liver area, increased C-reactive protein (CRP, >5 mg/dl), and the absence of CT arguments for recent intracystic bleeding, i.e. spontaneous intracystic content above 50 Hounsfield units in the original reads. Infectious episodes which met 2 or 3 of these criteria were categorized as “fever of unknown origin” (FUO). The PET/CT procedure was performed using the PET/CT Philips GEMINI TF (Philips Medical Systems, Brussels, Belgium) after intravenous injection of a mean dose of 300 ± 40.7 MBq (8.1 ± 1.1 mCi) of 18FDG. PET imaging was acquired in list mode and rebuilt in 4-mm transaxial slices with isometric voxels using time-of-flight reconstruction. Two transverse series of 2- and 5-mm slices were concurrently generated from low dose helical CT. No intravenous or oral radiologic contrast agent was administered at the time of PET/CT imaging. All of the PET/CT were initially performed for suspicion of abdominal infection at the physicians' discretion and read by 2 nuclear medicine physicians with at least 10 years of PET experience. PET findings were further confronted to CT results and discussed with 2 radiologists with at least 15 years of experience. For the purposes of this study, all 27 of the PET/CT images were methodically reviewed by one nuclear medicine physician with 10 years of experience unaware of any clinical, biologic, and radiologic data. PET/CT was considered as positive for CI when 18FDG uptake was focally increased lining at least one cyst, in strong contrast with the physiologic accumulation in parenchyma and distant from the pelvicalyceal physiologic excretion (14). The maximal standardized uptake value (SUVmax) was calculated for each patient using the following formula: [Pixel value (Bq/ml) × patient weight (Kg)]/[injected dose (Bq) × 1000 (g/kg)]. In addition, radiologic investigations performed independently from PET/CT imaging, i.e. CT and magnetic resonance (MR), were reviewed. The slice thickness of CT images was 3 mm. Intravenous contrast agents were systematically administered, except in patients with elevated serum creatinine level and/or declared allergy to iodide. CT and MR imaging (MRI) were considered as positive when enhanced wall thickening and focal inflammatory infiltrate were detected in at least one cyst. This study was approved by the Commission of Biomedical Ethics of the Université catholique de Louvain (Brussels, Belgium). From January 2005 to December 2009, 268 ADPKD patients were admitted to the Université catholique de Louvain Academic Saint-Luc Hospital (Brussels, Belgium). Abdominal infection was suspected in 46 patients. Among these, 27 PET/CT were performed in 24 patients. Thirteen infectious events in 11 patients met all of the criteria for kidney (n = 3) or liver (n = 10) CI, whereas 14 episodes in 13 patients only encountered 2 or 3 of them. The cohort included 2 patients under chronic hemodialysis and 14 renal transplant recipients (RTR). Three liver CI in 3 patients were definite, as confirmed by cyst fluid analysis. Clinical and biologic data are summarized in Table 1. Blood cultures grew Gram-negative bacteria in all cases (Table 2). CT imaging without contrast agent was performed in all cases but was contributive in only one. Conversely, PET/CT demonstrated a pathologic increase of 18FDG uptake lining liver pyocyst (Figure 1) in all cases, which guided cyst drainage. 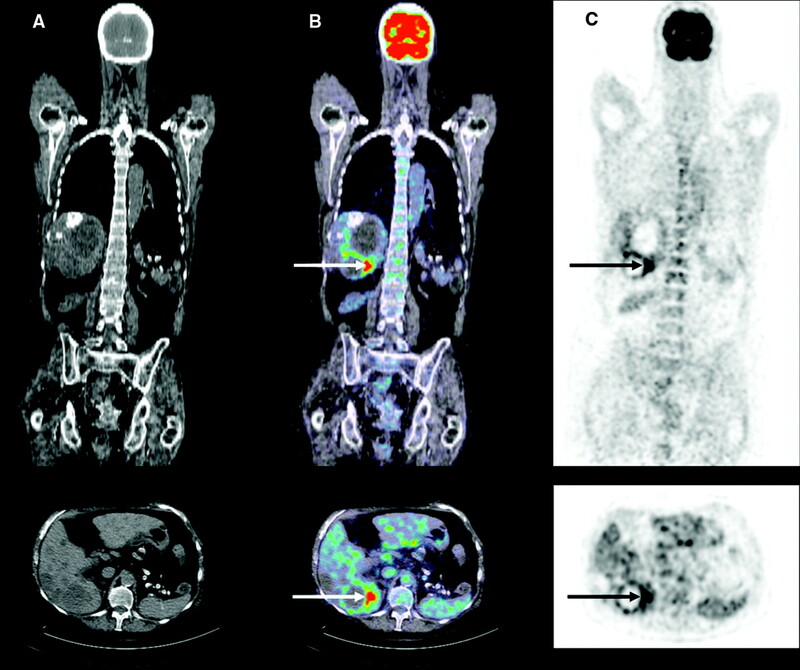 Representative imaging of liver cyst infection diagnosis (arrow) using positron emission tomography (PET) after 18fluorodeoxyglucose injection, coupled with conventional computed tomography (CT). The merge between CT (A) and PET (C) imaging corresponds to the central pictures (B). Coronal and transverse planes are shown in the upper and lower panels, respectively. In addition, seven liver CI were probable in five patients (Table 1). Blood cultures grew Escherichia coli in two patients (Table 2). CT imaging with (n = 2) or without (n = 3) contrast agent was performed in four patients but did not meet diagnostic criteria for CI in any of them. One patient had two separate CT studies. PET/CT demonstrated CI in six patients (85.7%) (Table 3). PET/CT was negative in a 74-year-old woman admitted for fever, chills, nausea, and pain in the right upper abdominal quadrant, in whom kidney transplantation from a deceased donor had been performed 19 days earlier. Clinical examination confirmed liver tenderness. Plasma CRP level was 23.9 mg/dl (normal value [NV], <1 mg/dl); neutrophil white blood cells (nWBC) count was 16.4 × 103/mm3 (NV, <7 × 103/mm3); serum CA19.9 level was 80.1 units/ml (NV, <35 units/ml). Blood culture grew E. coli. CT with contrast medium identified no infectious site and ruled out intracystic bleeding. PET/CT performed 3 days after admission revealed abnormal 18FDG uptake only in a thyroid nodule. Empirical antibiotherapy was initiated with ceftazidim for suspicion of liver CI and continued orally for 3 weeks with amoxycillin/clavulanic acid. Symptoms and signs rapidly resolved. The patient was discharged on day 10. Twelve days after discharge, the patient presented with similar symptoms. Antibiotics had been stopped 2 days earlier. Blood analyses showed: CRP, 16.4 mg/dl; nWBC, 13.5 × 103/mm3; CA19.9, 89.0 units/ml. Urine and blood cultures remained germ-free. CT with contrast medium showed no evidence of cyst infection or bleeding. Conversely, PET/CT performed on day 8 after admission identified a pathologic 18FDG accumulation lining cystic structures in the left part of the liver, in association with segmental 18FDG uptake in the right colon. Ciprofloxacine and metronidazole were started and planned for 6 weeks. The patient was discharged on day 13. One week later, she complained of two-sided calcaneal tendinitis. Ciprofloxacine and metronidazole were interrupted, and amoxycillin/clavulanic acid was resumed for 3 weeks. Ten days later, she complained of epigastric pain. Blood analyses showed increased CRP (15.7 mg/dl) and CA 19.9 (100.7 units/ml) levels. Blood and urine cultures were sterile. PET/CT imaging evidenced an increased 18FDG uptake in distinct small cysts located in the right part of liver parenchyma. Because of the number, size, and location of infected cysts, aspiration was not feasible. Intravenous metronidazole and ceftriaxone were administered for 3 weeks, with clinical and biologic improvement. Eighteen months later, the patient remained free of liver CI, with baseline CA19.9 at 47.6 units/ml. Three kidney CIs were probable in 3 ADPKD patients (Table 1). Urine cultures disclosed E. coli infection in two patients, with one case of bacteriemia (Table 2). CT was performed for all patients, with injection of contrast agent in only one. No cyst infection or bleeding was found in any case. MRI was performed in one of these patients and identified a thick-walled, heterogeneous cyst spontaneously contrasting on T1-weighted images with parietal enhancement after gadolinium injection (8). PET/CT confirmed CI in two patients by demonstrating a focal increase of 18FDG uptake lining pyocysts (Figure 2) but failed to evidence CI in a 62-year-old woman with stage IV chronic kidney disease (CKD). She was admitted for fever, chills, nausea, and right loin pain of 12 days of duration. Clinical examination revealed a positive right lumbar percussion. CRP was 10.0 mg/dl, and nWBC count was 6.5 × 103/mm3. Urinalyses disclosed leucocyturia, but urine and blood cultures remained negative. CT without contrast agent did not evidence cyst infection or bleeding, and PET/CT performed 8 days after admission showed a pathologic 18FDG accumulation in the gastric wall secondary to active and diffuse Helicobacter pylori infection. Classical H. pylori treatment was administered for 7 days, and antibiotherapy was continued for 21 days using ciprofloxacine for suspicion of CI. The symptoms and signs progressively regressed. The 1-year follow-up showed no recurrence of CI. Representative imaging of kidney cyst infection diagnosis (arrow) using position emission tomography (PET) after 18fluorodeoxyglucose injection, coupled with conventional computed tomography (CT). The merge between CT (A) and PET (C) imaging corresponds to the central pictures (B). Coronal and transverse planes are shown in the upper and lower panels, respectively. Fourteen PET/CT were performed in 13 ADPKD patients with suspicion of abdominal infection, which met only 2 or 3 of the above-mentioned criteria for CI. Mean nWBC count and CRP level were 8.2 ± 3.2 × 103/mm3 and 16 ± 10 mg/dl, respectively (Table 1). Twelve CT scans were performed in 11 patients, with no contrast agent injection in eight patients because of CKD. CT identified renal intracystic bleeding in two patients, renal CI in one, and diverticulitis of the small intestine in one, whereas no infectious site could be identified in the remaining eight episodes (66.7%). PET/CT showed no pathologic 18FDG uptake in 5 patients (35.7%) including both cases of intracystic bleeding, but identified distinct infectious diseases, such as gastritis (n = 1), angiocholitis (n = 1), small intestine diverticulitis associated with psoas abscess (n = 1), right colon diverticulitis (n = 1), prostatitis (n = 1), kidney graft pyelonephritis (n = 1), and infection of abdominal aorta aneurysm (n = 1). Typical 18FDG uptake lining renal cysts was found in 2 patients (14.3%). The first patient was an 81-year-old woman under hemodialysis for 6 years, who had previously suffered from kidney CI. She complained of abnormal fatigue and macroscopic hematuria in the absence of fever or pain. CRP was 24.2 mg/dl, and nWBC count was 7.5 × 103/mm3. Urine sediment showed both red and white blood cells, but the cultures remained sterile. Blood cultures grew Klebsiella oxytoca. CT without contrast agent because of iodide allergy showed no evidence of cyst infection or bleeding. Conversely, PET/CT identified a significant accumulation of 18FDG lining cystic structures in the lower part of the left kidney. She was treated with ciprofloxacine for 4 weeks with rapid improvement. The 2-year follow-up showed no recurrence of CI. The second patient was a 58-year-old RTR, with a past history of 3 CI and right nephrectomy. At the outpatient transplant clinic, she reported a 6-day fluctuating lower abdominal pain and chills, without urinary or digestive symptoms. Clinical examination confirmed hypogastrium tenderness. Urine culture was contaminated by Gram-negative bacteria. CRP was 8.1 mg/dl, and nWBC count was 8.9 × 103/mm3. CT without contrast medium showed one large pyocyst in the left kidney with thickened wall and distended renal fascia. PET/CT on day 9 after the onset of abdominal symptoms confirmed the hypermetabolic status of the infected cyst. Ciprofloxacine was administered for 4 weeks, with favorable evolution. The median delay between the onset of symptoms and PET/CT imaging was 9 days. Seven patients (29.2%) were diabetic, with a need for insulin in 3 of them. The mean glycaemia at the time of 18FDG injection was 117.9 ± 38.3 mg/dl. PET/CT imaging was usually acquired 95.3 ± 31.1 minutes after 18FDG injection and yielded positive results in 86.7% of CI cases (Table 3). Mean SUVmax measured in the most metabolic pyocyst reached 5.1 ± 1.7 g/ml. PET/CT results significantly changed the management of 7 ADPKD patients presenting with suspicion of abdominal infection (25.9%). By contrast, conventional CT failed to detect the infected cyst in 84.6% of patients and yielded negative results in 2 patients with definite liver CI (66.7%). The main diagnostic objectives in ADPKD patients presenting with a suspicion of CI are (1) the exclusion of noncystic infections; (2) the location and extension of infected cysts; and (3) the identification of concomitant conditions, like urinary tract obstruction (3). The lack of specific signs frequently retards the diagnosis and subsequent treatment. The definite diagnosis of CI requires cyst fluid analysis showing causative bacteria and neutrophils. However, this is not always possible or indicated, so that common criteria for CI rely on a constellation of clinical and biologic parameters (4). Conventional imaging procedures, like ultrasound, CT, and MRI, frequently fail to confidently identify CI (3,4). Radiologic features of pyocysts are unspecific and may be secondary to previous infections and hemorrhages, as well as chronic parenchyma injury. Cyst content of pus or blood may be indistinguishable (3), and contrast enhancement lining cyst walls can be caused by residual functional parenchyma (15,16). Furthermore, CT is most frequently performed in ADPKD patients without intravenous contrast medium because of CKD. Here, injection of contrast medium was performed in 30.4% of patients, and CT imaging yielded contributive results in only five patients (21.7%), including one with liver CI, one kidney with CI, one with diverticulitis, and two with intracystic bleeding. The accuracy of MRI in CI diagnosis, with and without gadolinium injection, remains unknown. To complement conventional radiologic procedures and improve the accuracy of CI diagnosis, techniques using radiolabeled tracers, like 111indium-labeled leukocytes and 18FDG, have been developed. The 111In-leukocyte scanning allowed the identification of renal CI in a few ADPKD patients in whom other noninvasive imaging procedures had failed to locate the infection (17,18). However, this technique requires the handling of blood derivatives and the ex temporane in vitro labeling process, as well a 48-hour delay before imaging. 111In-leukocyte scintigraphy is characterized by low image resolution, uneasy coregistration, and high interobserver variability (19). Moreover, the use of 111In-leukocyte scanning in febrile RTR is inadequate because of unspecific accumulation of leukocytes in renal and pulmonary parenchymae (20). Recently, PET/CT using the glucose analog, 18FDG, has been proposed in the detection and localization of tissue infection. Inflammatory cells are indeed characterized by a high metabolic status and increased uptake of 18FDG (9). PET/CT helped diagnose renal and hepatic CI in ADPKD patients with renal function ranging from mildly reduced GFR to ESRD (7–11). The advantages of 18FDG PET/CT are rapid imaging, high target-to-background ratio, and a direct coregistration with low-dose CT without radiologic contrast medium administration (21). Limitations include its relatively high cost and restricted availability. In addition, 18FDG uptake is not specific for infection and may be increased in other conditions, like tumors. The actual risk of malignancy in ADPKD patients does not seem to be increased (22). Liver cystadenocarcinomas are uncommon, and most kidney tumors show low-grade malignancy leading to low 18FDG uptake (14). The role of alternative tracers, like 18F-FLT, is currently being addressed (23). Similarly, the differentiation of 18FDG accumulation in residual parenchyma versus that in inflammatory cells lining pyocysts remains debated (24,25). Here, SUVmax measured in renal and hepatic pyocysts significantly differed from baseline 18FDG uptake (24). Moreover, 18FDG uptake in pyocyst wall was clearly distinguishable using CT data coregistration (Figures 1 and 2). The retrospective design of this monocentric study based on administrative databases represents the main limitation. This trial includes a small number of patients, with only five renal CI, and relies upon past clinical reports. All of the PET/CT images were blindly reviewed, but the lack of accurate medical literature about PET/CT in CI hampered the use of objective criteria, like SUVmax. PET/CT imaging was considered as positive for CI when 18FDG uptake was focally increased lining at least one cyst in strong contrast with the surrounding tissue. The mean SUVmax reached 5.1 ± 1.7 g/ml. This value needs to be further assessed in prospective trials. PET/CT imaging was contributive in 13 of 15 renal or hepatic CI, whereas conventional CT identified only 2 CI. Moreover, PET/CT evidenced 2 kidney CI, although both patients did not meet all of the conventional criteria, and identified alternative sources of abdominal infection in 7 patients. PET/CT yielded 2 false-negative results in one diabetic RTR during the immediate post-transplantation period and in a 62-year-old nondiabetic woman with stage IV CKD. Technical conditions might partly explain these false-negative results. In the first patient, the delay between the onset of symptoms and PET/CT was short (5 days), and the patient's glycaemia at the time of 18FDG injection (155 mg/dl) was significantly higher than the mean of all procedures. In the other patient, PET/CT was performed 20 days after the onset of fever, with an extended imaging delay (191 minutes). Current European guidelines for PET/CT recommend (1) the intravenous injection of 2.5 MBq/kg of body weight 18FDG activity (±10%), and (2) an interval between 18FDG administration and the acquisition of 60 minutes (26). The efficiency of PET/CT in immunocompromised patients remains poorly established. PET/CT has been shown to distinguish AIDS-related opportunistic infections from malignancies (27). In RTR and CKD patients, prospective trials investigating PET/CT efficiency in identifying infectious sites are lacking. The main differential diagnosis of CI in ADPKD patients is intracystic bleeding. Significant cyst hemorrhage is usually detected by conventional CT, and the ability of PET/CT to distinguish cyst infection versus bleeding remains unknown. Increased 18FDG accumulation has been reported in both acute and resolving hematoma in extrarenal sites (28,29). Here, 2 kidney cyst hemorrhages were identified by CT, with no pathologic 18FDG accumulation. Further prospective evaluations are required to establish PET/CT accuracy in excluding intracystic bleeding and to define the optimal delay between the onset of symptoms and PET/CT imaging. In conclusion, this retrospective series underscores the usefulness of PET/CT to confirm and locate CI, as well as to identify alternative sources of abdominal infection, in ADPKD patients. The authors thank Max Lonneux and Francois-Xavier Hanin for the original readings of PET/CT and Laurence Annet and Etienne Danse for the original readings of CT images.